We’ve all been there; you or a family member starts to feel sick, maybe even a little tickle in your throat, leading to days of cough drops and lemon-honey tea. Most brush it off as just a simple sore throat—it happens to everyone! But what if it’s more? While you shouldn’t jump to conclusions, it is good practice to look for signs and symptoms that might point to something more serious than just a sore throat. Strep throat and tonsillitis often start with a sore throat, but then escalate to other symptoms. We’re here to help you determine whether you or a loved one has symptoms of strep, tonsillitis or just a sore throat. Strep throat is an infection caused by Group A streptococcus, and it primarily attacks the throat. The throat and tonsils end up getting infected, causing symptoms such as throat pain, headaches and fever. One of the more distinguishing symptoms of strep throat is that there tends to be red spots on the roof of the mouth of the infected party. Additionally, the lymph nodes at the side of the neck become swollen and tender. According to the CDC, strep throat does not typically include a runny nose, pink eye or coughing, so if your child is experiencing these symptoms, it may not be strep after all. Tonsils are unique in that they are the body’s first defense mechanism for infections. According to the CDC, the tonsils defend your body when germs enter through your mouth, which is why they are susceptible to inflammation. While tonsillitis might sound bad, this infection of the tonsils is typically caused by a virus. The tonsils, which are located at the back of the throat, become swollen and inflamed, causing pain when swallowing, and swelling of the lymph nodes in the neck. Some people are under the impression that if you get tonsillitis once, your tonsils will have to be taken out. This is not the case anymore, as only people who frequently get bacterial viruses that cause tonsillitis are considered for surgery to remove tonsils. Symptoms of tonsillitis are very similar to strep throat, as the infection might also cause a fever, throat pain and headaches. However, tonsillitis is unique in that there are typically patches of white or yellow on the tonsils, bad breath and an upset stomach. 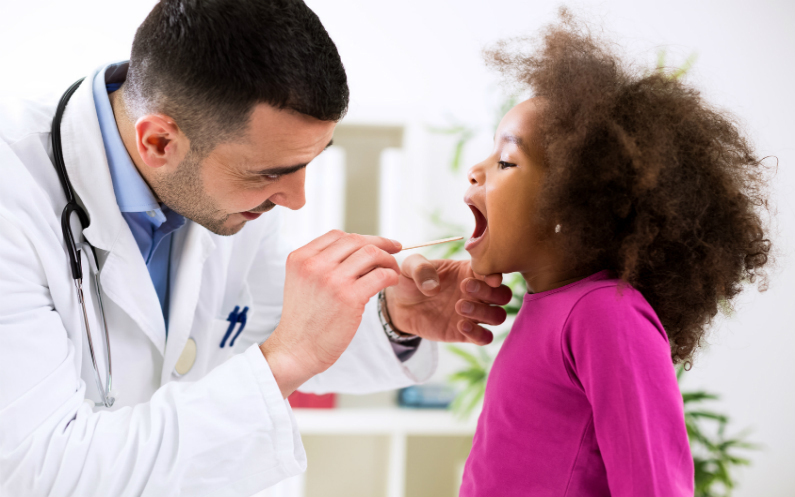 It can be difficult to determine whether or not your child is suffering from a sore throat, strep throat, or tonsillitis, but if your child’s sore throat or throat pain persists after 24 hours, you should definitely take them to see a doctor. While it may just be a sore throat, it is always best to take precaution. If your child is experiencing difficulty breathing, seek help immediately. However, for adults, you should consider seeing your doctor if your throat pain continues after a few days, or the symptoms worsen. If you develop a high fever or experience trouble opening your mouth you should seek out medical care. We know that your schedule is busy. Skip the stress of trying to find a good time to see your doctor and stop into one of our eight locations. We have clinics open in Montana, Kentucky and Colorado; see all of our location hours here. You don’t have to make an appointment, simply stop in to receive fast and quality care.